Has anyone else ever found PSR Variations sometimes bleed around the Act Turn Drivers? Especially slides...? I feel like the Investigation actually started towards the end of act 1 (not shown, but signpost 1 is Being so it's a slide). The interrogation that occurs at the point in the story starts with a lot of Being (lying, playing roles) and then moves to a concern over Becoming at the Second Driver. 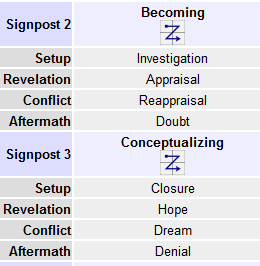 In Signpost 3, based on what happens in the story I think the order is actually Closure-Denial / Hope-Dream. (I didn't use the PSR to plot.) There is some Dream stuff toward the end of act 3, but the strongest is that the Fourth Driver turns everything into a huge nightmare for the characters. So the whole Fourth Driver sequence is Dream, or Nightmare. Isn't there a point where Doubt would have to morph into Closure? A becomes S (in this case). Wouldn't foreshadowing be one of the ways this is done? And doesn't the three dimensional spiraling of the quad (like a slinky stretched) suggest bleed over? I can't remember exactly, but doesn't the Psychology component of a quad shift closer to something else (not being the other three). Just some half asleep musings.